RDX G-CORE ZERO IMPACT 4FT MAYA HIDE LEATHER FILLED PUNCHING BAG SET. 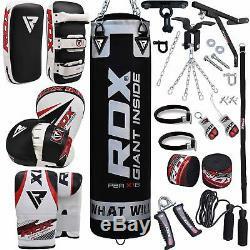 RDX Boxing Set With Zero Impact G-Core Filled 4FT Punching Bag Great deal while our supplies last! 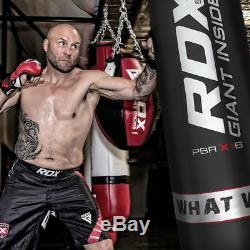 RDX Filled Boxing Punching Bag set offers you everything. This Punching bag is of immense quality and reliable due to double layer skin. It comes with a reinforced stainless steel wall bracket to hold the case. RDX is also throwing steel chains, a swivel, jump rope and D-Shackle to complete the package. Filled Punching Bag with Chains and Gloves Include! RDX Zero Impact G-Core twinned layer non tear Maya Hide Leather Technology Punching Bag. Supplied with free steel chains, swivel and Pro bag gloves. Heavy duty zip-fastened top closure ensures maximum fill potential (can be used outside). Tethered loop facility at the base of the Filled punching bag ensures swing reduction. 8 Piece Filled Punching Bag Set Include! 1 x RDX Bag Gloves padded with Gel foam padding. 1 x RDX 16 Gauge Heavy Duty Powder Ceiling Hook. 1 x Hook for Punching Bag Strap, 1 x D-Shackle, 1 x Punching bag Chain Strap. 1 x Steel chains (4 heavy duty suspension chains), 1 x RDX Fixture and fittings. 1 x RDX G-Core twinned layer non tear Filled Punching bag 4ft (waterproof & can be used outside). 13 Piece Filled Punching Bag Set Include! 1 x RDX 18 Gauges High-grade Powder Coated Steel Heavy Ceiling Hook. 1 x Pair of Hand Wraps, 1 x Steel chains, 1 x Jump rope, 2 x Bracelet. 1 x Hand Gripper, 1 x Key chain, 1 x Boxing Glove (Mini) for hanging, 1 x Boxing Glove Keyring. 1 x RDX G-Core TM twinned layer non tear Filled Punching bag 4ft (It's waterproof and can be used outside). 17 Piece Filled Punching Bag Set Include! 1 x RDX Patent Pending Boxing gloves with highly compressed EVA-LUTION Foam padding. 1 x RDX 16 Gauge Heavy Duty Powder Coated Iron Diagonal Bar, 1 x RDX 16 Gauge Heavy Duty Powder Coated Iron Horizontal Bar. 1 x Pair of Hand Wraps, 1 x Steel chains, 1 x Swivel, 1 x Jump rope, 1 x D-Shackle, 1 x Punching bag strap, 1 X Punching Bag Strap Hook. 1 x RDX Fixture and fittings, 1 x Hand Gripper, 1 x Boxing Glove (Mini) for hanging, 2 x Bracelet, 1 x Boxing Glove Keyring. 1 x RDX G-Core twinned layer non tear Filled Punching bag 4ft (It's waterproof and can be used outside). 37cm long and 19cm wide. Heavy duty strong Maya Hide Leather construction. IMT' three layers of Gel integrated thick Foam padding for heavy duty shock absorption. Triple re-enforced stitched and riveted leather handle. Double layered webbing re-enforced buckle straps. Maya Hide leather construction with inner Maya Hide hand compartment offers long-lasting durability. Lightweight design content with max shock-absorbing EVA-LUTION FOAM and Supremo-Shock Foam cushions against high impact strikes. EZ-Grip Technology coupled with Quick-EZ hook and loop wrist strap offers max traction and support. Strategically placed slits and perforations allows moisture and hot air to ventilate for total hand comfort. Curved design aligns perfectly with hand to allow no slip grip and distribution of shock-impact. 1 x RDX Maya Hide Leather Straight Thai Pad with IMT Integrated 3 Layer Foam. 1 x RDX Pro Brand New Maya Hide Leather Pair of Curved Focus Mitts. Filled Punching Bag with Chains Gloves Include! 1 x RDX G-Core twinned layer non tear Filled Punching bag 4ft (waterproof can be used outside). 1 x RDX G-Core twinned layer non tear Filled Punching bag 4ft(It's waterproof and can be used outside). EZ-Grip Technology coupled with Quick-EZ hook and loop wrist strap & offers max traction and support. B2Fitness is one of the worlds leading suppliers of high performance Boxing, MMA, Fitness, Gym equipment, apparel and accessories. This enthusiasm and focus thrives on teamwork, experimentation, passion, determination, creativity and positivity. We look back with pride on the many milestones that are behind us, and also look towards the future with ambition and confidence. Today, many Boxers and MMA fighters around the world choose to use RDX products as they prepare for and compete in matches, tournaments and championships. Please allow up to 24 hours for your order to be processed and item dispatched. B2 Fitness offer a complete guarantee. RDX IN CAGE FIGHT NIGHT. You may also be interested in following Products. The item "RDX Punching Bag Training MMA Punch Bag Boxing Bag Mitts Gloves Heavy Swivel Gym" is in sale since Friday, July 21, 2017. This item is in the category "Sporting Goods\Boxing, Martial Arts & MMA\Training Equipment & Supplies\Punching Bags". The seller is "b2fitness_usa" and is located in Houston, Texas.